52 Ways to Tackle Leadership for Your Success: The Book – LEAD IN A WAY THAT CREATES LEGACY! 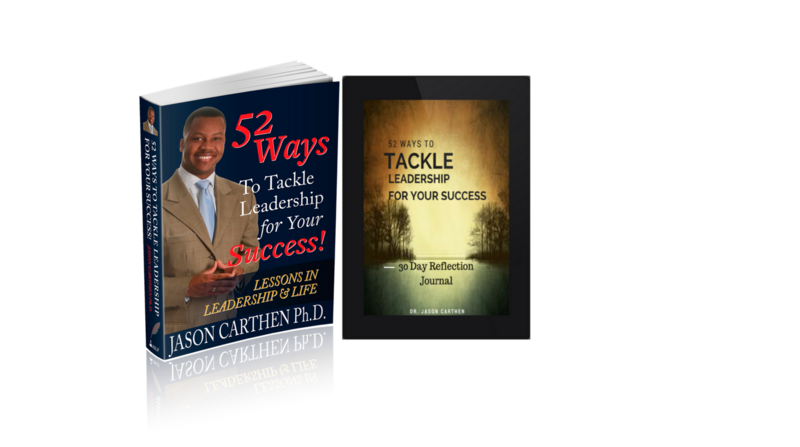 52 Ways To Tackle Leadership for Your Success! 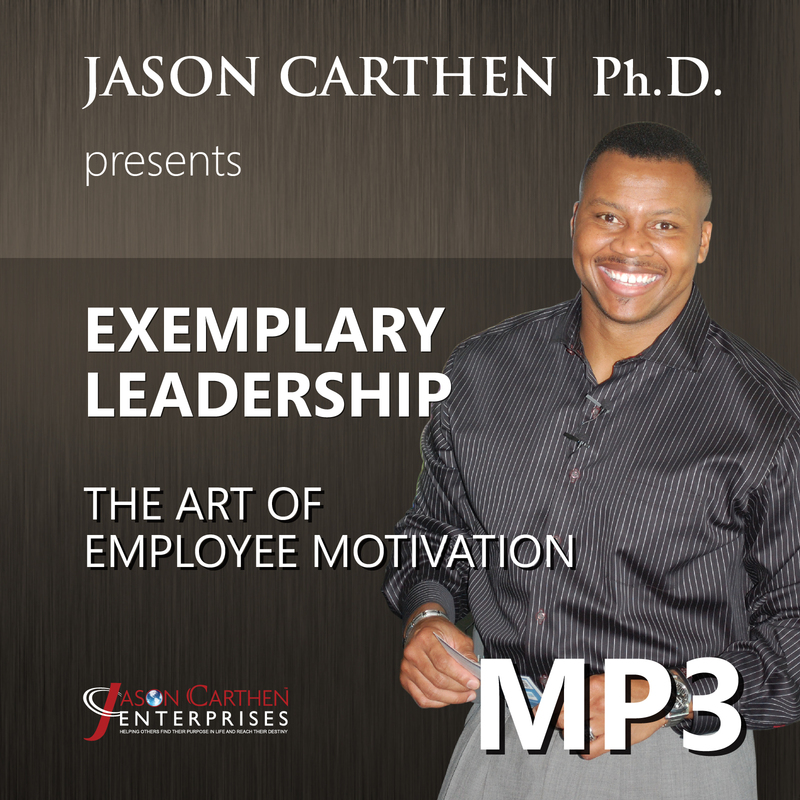 Dr. Jason Carthen, one of the top leadership experts in the world, provides a clear roadmap to increase anyone’s capacities for leadership while making it fun and interesting during the process. 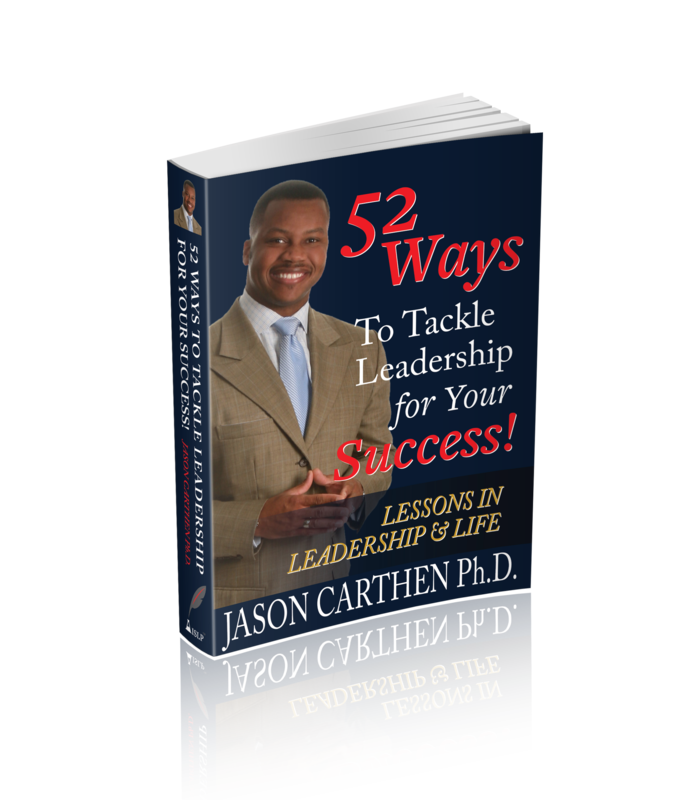 Click to Buy 52 Ways to Tackle Leadership for Your Success! WHEN YOU ORDER 10 OR MORE GET FREE LEADERSHIP TRAINING WITH YOUR ORDER! Motivation in organizations is crucial for long-term success! When you have employees that are motivated your productivity is going to go up and the organizational environment is going to be healthier. This is a perfect companion to 52 Ways and for anyone aspiring to lead others and themselves! Positive leadership creates a heart connection with followers that raises them to a different level of performance…which can ultimately change their lives. Share the impact of positive leadership with others to start a movement! To be successful in todays’ changing landscape of business, leaders must continually improve their leadership capacities. In this step-by-step resource guide, former professional athlete, Dr. Jason Carthen provides readers with weekly guidance packed with powerful stories and leadership techniques that cut to the heart of relational leadership. Dr. Jason has crafted a game-changing and clearly written book on how to lead in a way that captures the heart of your people while empowering them to do their very best. Enjoy your journey with Dr. Carthen. Lean in and enjoy the mantle of leadership bestowed upon you. Accelerate your leadership learning curve and get the results you really want—work at your own pace...fast or slow, just be intentional. When you help your team lead with intentionality, the entire organizational culture is impacted positively. The result is a balanced organization that is focused on the heart of one another while not sacrificing the productivity and ultimately success of the organization. This package provides a clear process for the leader to grow and develop along with implementation steps that can be shared with supervisors or direct reports. Dr. Jason Carthen is a former Professional Football Player with the World Champion New England Patriots, an international speaker, author, blogger, media-personality, and philanthropist. 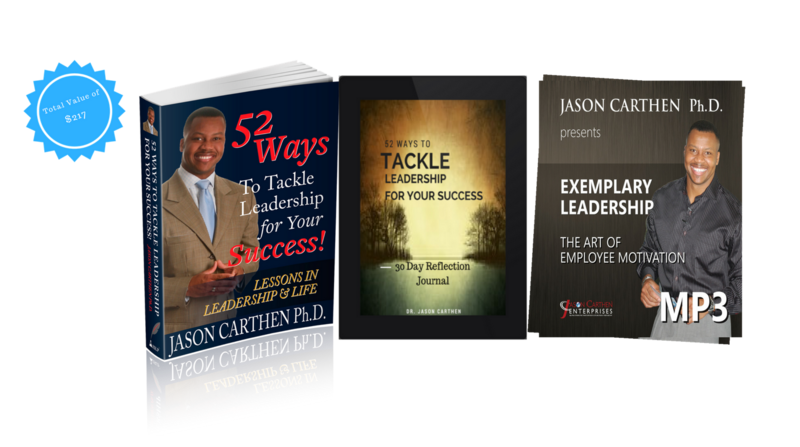 His global consultancy Jason Carthen Enterprises works with Fortune 500 companies and Fortune 100 Companies to provide quality training & coaching, for thousands of men and women each year – on the subjects of leadership, team dynamics and organizational culture. Some of his clients include The White House, Chick-Fil-a, FedEx, The National Football League, The American Dairy Association, Cleveland Clinic Health Systems, Human Synergistics, Shamrock Companies, Rheem and The Federal Government to name a few. His research based Leadership Solutions, and Personal development tools are recognized and used by some of the most successful companies in the world and have helped shape over a half million successful leaders, managers and employees. As a renowned speaker, radio host, and media personality, Dr. Jason has risen to international prominence speaking on matters of leadership, business and motivation. WHO IS 52 WAYS FOR? Those striving to lead in business or ministry without struggling to find their way and to demonstrate a heart of compassion. Men and women who want to succeed at work and maximize their leadership calling through reflection and intentional growth. Including adult learners, post-graduates and young professionals who want to capture the essence of what it means to lead regardless of the situation. Parents who are consistently looking for leadership answers that will help them navigate the uncertainty of parenting and relationships. Those who have decided to retool, but still look to contribute to their leadership calling in life while leaving a lasting legacy. Whoever wants to lead with heart while creating an undying legacy. For press and publicity inquiries regarding 52 Ways, please contact Mireidy at admin@52waysleadershipbook.com. Absolutely. You can purchase 52 Ways from any retailer, either online or in person. Just be sure and save your receipt. You’ll need the receipt number to claim your bonus. Do I qualify for the bonus if I purchase the eBook? All bonus materials will be delivered via email as soon as we can verify your purchase. (This usually takes 20-30 minutes.) Please add admin@52waysleadershipbook.com to your address book or trusted sender list so these important notifications arrive in your inbox! Please note all bonus materials are digital—there are no physical products. Of course! Our support team is here to help. Just email us at support@52waysleadershipbook.com, and we’ll take care of you.